Have you ever wanted to fly, to walk through walls, to travel in outer space, to explore exotic planets and realms, to visit friends and loved ones, to experience spiritual dimensions, or just to have thrilling adventures beyond your physical body? * If so, then this is the book for you! In this masterfully evolved 10th anniversary edition of his famous classic, author Robert Bruce provides everything you need to understand and achieve out-of-body experience. * Bruce provides innovative techniques on how to work with your higher-self to activate and develop your energy centers, to exit your body, to navigate the astral and mental planes, and to return safely with clear memories of exciting out-of-body adventures. 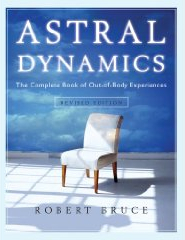 Drawing on decades of experience not only astral travelling himself, but effectively teaching others how to get out-of-body, Bruce provides everything you need in one superb volume: a personal narrative, a How-To and trouble-shooting guide, and a groundbreaking theoretical perspective. * Whether you are a skeptic, a veteran astral projector, a novice, or an armchair traveller, there’s treasure here—a masterpiece of understanding and achieving Out-of-Body Experience.